East London's postcodes have long been home to some of the raddest real people in London: It's an undisputed hub of design activity and the place where buyers, photographers and stylists can't help but get inspired. If there's a hipster trend on a potential rise, you can bet it's been going on in E2 or E8 (and now way beyond because there's a new gen moving further out) for at least the past couple of years. We all know that it's where you'll find some of the most varied outfits in the city, but it's also becoming a hive of activity for a really specific market: denim. Until now, other parts of the world have had the monopoly on luxe jeans. Los Angeles. Japan. Turkey (yes, that's where some of the most brilliant jean manufacturers are based). But now it's all happening in Shoreditch, Hackney, Clapton, Dalston and Walthamstow. "I wanted to open my specialty shop in a neighbourhood," explains Erin Fridja, who is a bona fide denim guru and set up her jean-focused Clapton shop, Bad Denim, in 2015. It has since become a destination store for any true fanatic. "I was inspired by walking around Brooklyn, in residential seemingly nonretail areas, where I came across surprisingly incredible specialised little boutiques—sneaker stores or bookshops arising out of nowhere. The kind of delightful unexpected thing where you think to yourself, Oh, what is that doing here? I love it—what a find." But more than just enjoying the location, it makes total sense. The city's most ardent denim fans are all in close proximity, and they're willing to try out new labels and fresh ideas first—not to mention avoiding the dreaded trek into the busiest central parts of the capital. It was when I was recently introduced to a new brand, King & Tuckfield (which produces top-quality denim at Black Horse Lane Ateliers), that the scene started to piece together. As Erin explains: "We've got some of the best denim design offices in Hackney—Keji, Aries, plus Burds and Bethnals are all based here," she says. "Manufacturing-wise, I was so psyched when Black Horse Lane Ateliers opened up in Walthamstow—it's a great space and incredible to bring manufacturing back to London. They also offer classes on stitching and indigo dyeing for the community, it's such a great idea and spirit. Also there is the London Cloth Co., which weaves denim for some amazing brands on looms right here in Clapton." So this is a message to L.A.: Watch your back; we're coming for your major stockists! All you need is a white tee and sneaks. Ankle-swingers are the hem du jour across the UK. The smartest denim jacket we ever did see. 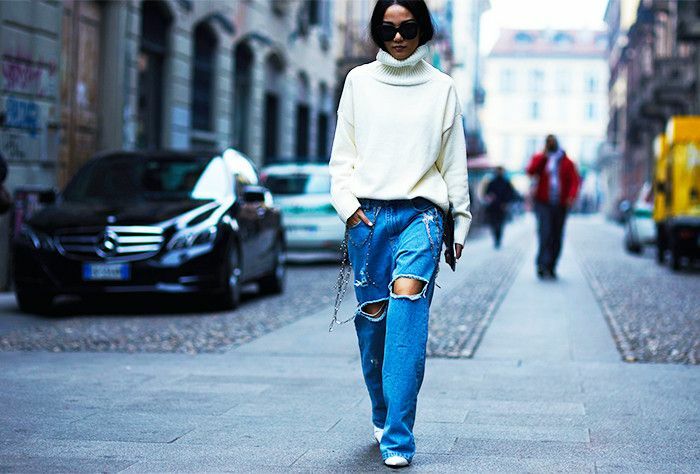 Erin tells us the reworked denim trend is still sought after in east London. These have a slight 1940s workwear vibe to them. Mom jeans and cowboy boots—you heard it here first. Next up, the S/S 17 trends to know now.